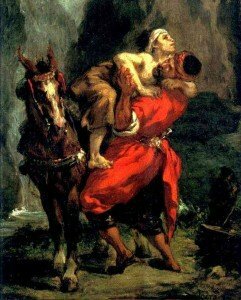 Jesus’ parable of the “Good Samaritan” is one of the best known and loved stories in all of scripture. A careful reading of this account will reveal a very different perspective than what you might have thought was the moral of the story. When you look at the story in a Jewish context, the question that Jesus asked, “Who is my neighbor”, takes on a very different cast. In verse 25, the man who asked Jesus the original question, was an “expert in the law”. He was probably a member of the Pharisee sect of religious people. This group had a tremendous love and respect for the Torah. The verses he quoted in verse 27 came out of Deuteronomy 6:4-5 and Leviticus 19:18 and was called the “Shema”, which means , “to hear”. It was a set of verses that every Jew knew by heart and was said several times a day. These same verses were quoted by Jesus in Matthew 22:34-40, in response to the question, “which is the greatest commandment”? The significance of the question and the answer is that total devotion to God is demanded. In Verse 29, the expert tried to throw Jesus a curve by asking, “Who is my neighbor” (as in love your neighbor as yourself)? He was trying to get Jesus to say which of the different classes of people in society that you were required to be friends to. He was saying, “How far do we have to go in this ‘love your neighbor’ business?”. He received a surprising answer from Jesus. In verses 30-37, it says that the priest and the Levite both walked by on the other side. Who are they and why would they walk by and leave a man who was obviously in trouble? The impression is almost always given that they were an uppity, high brow, hypocritical type of person that had no use or respect for this common man. The reality is, however, much different. The priests were a very godly, highly respected group of men in Jesus day. There were set apart by God and were totally committed to their priestly duties. They were in charge of the Temple and all the feasts, sacrifices and the rituals associated with them. They had a very strict code of do’s and don’ts given to them by God in Leviticus. These priests served in Jerusalem on a rotational basis. The head of the priests was the High Priest, who represented the whole nation before God. The priests were responsible for interpreting and explaining the Mosaic Laws. They devoted their whole life to the text. The Levites were also a part of the priesthood and their job was to serve in the Temple. They worked on the Temple grounds and assisted the priests in carrying out the daily business of the Temple. Only Levites and priests could enter the Temple interior. Even Jesus was not allowed to enter the Priest’s court. The reason the Priest and the Levite went around the beaten man had nothing to do with their personalities, but instead was a matter of the Law, which they had to uphold. The priests, according to Leviticus 21:1-4 and Numbers 19:11-16 (esp. v16), were not allowed to touch any dead body or anything with blood on it because it would make them unclean. In this hypothetical situation, they had to choose between helping the man or breaking God’s Law. It was a tough decision for them, but since they were to be totally devoted to God, they chose to uphold the law. Jesus was trying to point out the mistake the Jews were making of being so intent on the law that they would ignore the correct thing to do. They kept the “letter of the law”, but ignored the “heart and intent of the law”. How about the Samaritan? What is his significance in this story? To a Jew, they were the most despised and hated of all the races of people. The Samaritans were a pagan, half breed race of people who were placed in the middle of the Promised Land by the hated Assyrians, who had conquered Israel several centuries earlier (See 2 Kings 17:24-40). They brought their pagan religions and practices with them, and in the Jewish mind had polluted a whole section of the country that God had given the Hebrews. Most Jews would not even go through Samaria or speak to them or help them in any way. Now do you see who the neighbor was? We’ve always been taught that it was the guy in the ditch, help out your neighbor who is in trouble. Be a “Good Samaritan” and help the guy in trouble. That is still a good observation and a moral in the story, however, that is not what Jesus’ point of the story was! Jesus’ real point was that the “Samaritan” was the answer to the question, “Who is my neighbor”? Look how the man answered Jesus ‘question. ‘”which one of the three was a neighbor to the man”? He had to agree that it was the Samaritan, but he couldn’t even bring himself to say the word Samaritan! He just said, “The one who helped him”! The “expert in the law” did not want to have to be nice to a Samaritan and treat him as a neighbor! It killed him to say it! The person, the race, or group of people who are politically different, someone who you despise is also your neighbor. If you are going to love your neighbor as yourself, it applies all the way down to the person you hate the most. Jesus’ parable sure makes these two commandments a lot harder to keep! Who or what group is your Samaritans? Are you able to love that neighbor as yourself? By looking at this story through the eyes of the people that lived during the Bible time period, it sure makes the meaning a lot different than what we taught in this children’s story. It also makes keeping the two commandments that Jesus said were the most important, a lot harder to keep! There is an interesting story about Jesus and his disciples that occurs in the gospels only in Luke 9. The time frame of the story is in the very late stages of Jesus public ministry. He has taken his disciples to the northernmost part of Israel, to Caesarea Philippi, where He revealed to them what was about to take place as far as his death and resurrection were concerned. Then he takes three of the disciples, Peter, James, and John up on a high mountain to experience what has been called the “transfiguration”. While they are watching, Jesus meets with and talks to the “angelic” appearing Moses and Elijah, two of Israel’s greatest prophets, who have long since died and gone to heaven. They also see their rabbi transfigured and hear the voice of God thunder from the heavens. It is obvious that they are in special company in a special time in history. After this amazing incident, the Bible says that Jesus, realizing that his time to be crucified was at hand, set his face resolutely towards Jerusalem. To get to Jerusalem, which is south of the Galilee quite a distance, the group decided to go the shortest route through the Samaritan mountains. They had taken this route in the past, if you remember when Jesus met the Samaritan woman at Jacob’s Well in Samaria. The Samaritans and the Jews did not get along, at all. Most Jews would not even risk going through Samaria and the same could be said for the Samaritans, as they were reluctant to go through Israel. Their hatred for each other had been going on for centuries. As they traveled in Samaria, Jesus sent some messengers ahead to reserve a place to stay and to have something to eat. However, the Samaritans were not friendly at all, and would not let the disciples make any arrangements for their rabbi. When James and John saw the Samaritans rude behavior, they quickly asked Jesus,”Can we call down fire from heaven on these guys and teach them a lesson and destroy this Samaritan village?”Jesus rebuked James and John and said, we’ll just go to another village. In the King James translation, Jesus replies, “I did not come to destroy men’s lives, but to save them”. Why would the disciples want to call fire down from heaven, besides the obvious fact that they were mad at them? If we knew our text better, the answer would be obvious. Elijah, the first great prophet of Israel, the one that they had just seen on the mountain, had done the exact same thing to the exact same people, in the exact same area, for the exact same reason! Look at the story in 2 Kings Ch.1! By gosh, if Elijah didn’t put up with these unruly Samaritans, then neither will we! Also, Elijah had called down fire from heaven in the contest with Baal on top of Mt. Carmel. So the fire from heaven was a prophet thing! Moses, the other great leader of Israel that they had just witnessed, also called down fire from heaven on the Sons of Korah in Numbers 16:35 and on Aaron’s sons in Leviticus 10:2. So the disciples were trying to emulate these great prophets when they asked Jesus for permission to scorch these Samaritans! They had great precedent to do so; surely their rabbi would go along with it. Jesus, however, said, “My ministry is going to be a little different “. What Moses and Elijah did was appropriate for that time and situation, but my ministry is going to be about trying to save these people’s lives, not wipe them out”. In fact, Jesus uses the Samaritans as examples in a lot of his parables and stories to show that we’ve got to love even our worst enemy, e.g. the story of the Good Samaritan. Doesn’t this make this story a lot more interesting when you know the history and the context behind what was happening? We need to know our Hebrew Testament so much better! That is the book and the stories that Jesus and his disciples would have been so familiar with. This should motivate us to be better students of the text! Our rabbi and his disciples certainly were good students! Does it Seem Like Jesus Always Shows Up Four Fays Late? In this story about Lazarus, we find an amazing truth about God; He is always just on time, never early, and never late! His timing is always perfect! The rub is – He never shows up quite fast enough when we are in the middle of a problem! We always need Him right now and we are wondering where He is and if He is even going to show up! Mary, Martha and Lazarus had been great friends of Jesus. It says that Jesus loved them dearly. However, when Lazarus was dying, Jesus stayed put, because his Father told Him to. 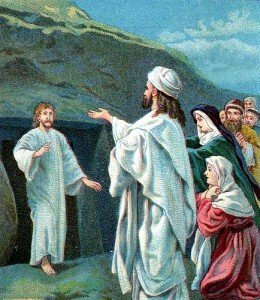 Jesus knew that Lazarus was already dead (vs. 11). God had orchestrated this event so that Jesus would be glorified and the disciples would see something that would sustain them in the tough days ahead. This miracle also initiated a bunch of things that eventually led Jesus to the cross. God’s timing was perfect. But, to Mary and Martha, it was four days late. Don’t you know that Mary and Martha were anxiously looking out the window, expecting Jesus to show up and save their brother? Don’t you think that they prayed earnestly and expectantly that He would come before it was too late? Don’t you think they were extremely disappointed when their supposed friend, the miracle worker from the Galilee, didn’t show up? He was just a couple of miles away and he didn’t come! Jesus hurts for us when we are hurting. He was deeply grieved at the pain he knew Mary and Martha were in. But, God had a bigger perspective on the problems that they were going through. God always knows what He is doing, and everything is done according to His plan. That doesn’t keep us from asking and begging God to show up sooner, but often it just doesn’t work out that way. Sometimes God doesn’t make sense to us, but He is still God and knows what is best. He will always show up, but often not in the way or timing that we are hoping for. His eternal perspective is much clearer than our limited look at the problem that we are currently in. The great lessons of this story are that God hurts with us and feels everything that we are going through and He will always show up and work out His perfect will for us. This should motivate us to keep praying and asking God to intervene, even when it seems as nothing is happening. As Dr. Dobson from Focus on the Family often says, “even when nothing’s happening, something’s happening!” Keep leaning on the Rock! P.S. I thought you also would like to hear a couple of interesting P.S.’s from the story on Lazarus. There was a practice among the Jews of that time period to put someone in the tomb and not seal it at that time. They would mourn outside the tomb for 3 days, then move the stone and call out the person’s name three times to see if they would answer , and maybe still be alive. If nothing was heard, then you sealed the tomb. When Jesus came, the time was already past, so they would have known that he was dead. 2) The second P.S is kind of humorous and occurs just a little bit later in the Jesus story in John 12:9-11. The chief priests, when they saw how popular Jesus was becoming because of the healing of Lazarus, made plans to kill Lazarus as well as Jesus! It’s kind of funny that the guy that Jesus just raised from the dead was somebody they were going to try to put in the grave again!